Economy is another reason for thoughtful aggregate selection. You can often save money by selecting the maximum allowable aggregate size. Using larger coarse aggregate typically lowers the cost of a concrete mix by reducing cement requirements, the most costly ingredient. Less cement (within reasonable limits for durability) will mean less water if the water-cement (w/c) ratio is kept constant. A lower water content will reduce the potential for shrinkage and for cracking associated with restrained volume change. 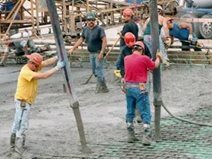 Here's an overview of the most important factors to consider when selecting and proportioning concrete aggregate. Photo 1 - Note the well-graded particle size distribution for this conventional concrete mix. 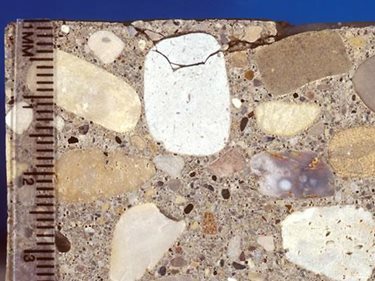 Learn more about the materials that go into a good concrete mix. Make sure that your concrete producer purchases good-quality aggregate as verified by regular aggregate test results in compliance with ASTM C 33, "Standard Specifications for Concrete Aggregates." 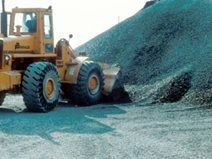 A history of good performance of a local aggregate also provides an indication of how well the material performs in service. Those that are friable or susceptible to being split. Those with significant quantities of soft and porous materials. 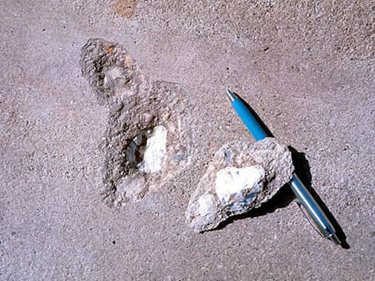 Certain kinds of "chert," since they may have very low resistance to weathering and can lead to surface defects, called popouts (Photos 2 and 3). As a naturally occurring material, aggregate will sometimes include weathered or unstable particles in the delivered product. The allowable percentage of deleterious substances for both fine and coarse aggregate are listed in ASTM C 33 Tables 1 and 3, respectively. Some projects might require even more-stringent limits. 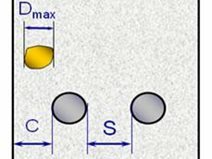 To avoid post-placement problems in concrete that are difficult to rectify, verify that these limits are not exceeded at the time of material submittals. An optimized gradation based on aggregate availability and project requirements will result in an economical concrete with good workability and finishability. 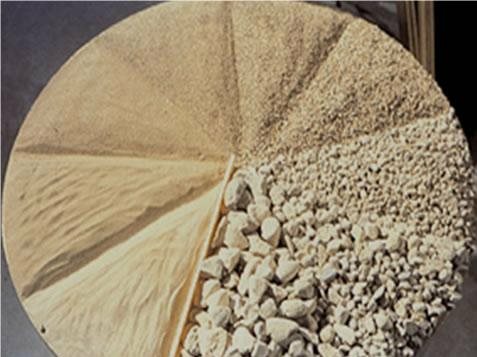 The proportions between coarse and fine aggregates will change based on the unique characteristics of each aggregate, the placement method, and the finish desired. 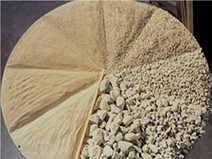 The dividing line between fine and coarse aggregate is the 3/8-inch sieve. The fineness modulus (FM) is an index of the fineness of an aggregate. The FM is calculated by adding the cumulative percentages by mass retained on each of a specified series of sieves and dividing the sum by 100 (see Table 1). The FM for fine aggregate should fall within the range of 2.3 to 3.1. The FM should not change more than 0.2; otherwise, mix adjustments may be necessary. Excessively fine materials will have a higher water demand and typically result in a sticky mix. Excessively coarse material will produce harsh mixes that are more difficult to place, consolidate, and finish. retained between the No. 100 and No. 4 sieve divided by 100. Fine aggregate should fall within gradation limits provided in ASTM C 33, Section 6. If there is a deficiency in a locally available fine aggregate, concrete may benefit from the addition of air entrainment, additional cement, or a supplemental cementitious material (SCM) to address these shortcomings. Broad coarse-aggregate gradation ranges are listed in Table 2 of ASTM C 33. These broad gradation bands are for use all across the country. Once a gradation is selected for a project, maintaining the gradation within tight ranges will achieve greater batch-to-batch consistency. This is typically accomplished by properly stockpiling aggregates and reworking stockpiles to counter excessive segregation (Photo 4). Often aggregates are analyzed using combined grading of fine and coarse materials proportioned as anticipated in the proposed concrete mix (Photo 7). This provides an estimate of how the blend will perform in concrete. Every region has its own deficiencies in aggregates, but once a combined aggregate gradation is plotted (percentage retained vs. sieve size), these deficiencies can more easily be identified and remedied. Alternative aggregate sources or additional aggregate blending can then be considered to approach the elusive "ideal" gradation that provides the best workability, pumpability, reduced shrinkage, and economy (Figure 1). Note that eliminating the sand from a mix transforms conventional concrete to a "no-fines" mix, also known as "pervious" concrete" (see Pervious Concrete Pavements). Pervious concrete qualifies for LEED points, a green building rating system developed by the U.S. Green Building Council (USGBC), because it permits runoff to percolate directly into the subgrade, recharging the ground water table. 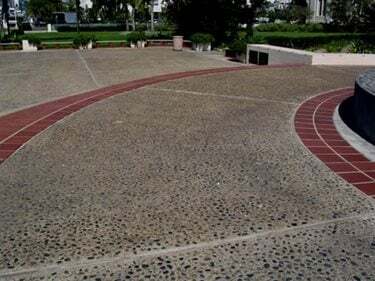 Contractors placing decorative exposed-aggregate concrete, where appearance is a prime concern, should pay special attention to the aggregate shape, texture, color, and overall appearance to yield the best looking final product (Photo 8). When placing architectural concrete, you should test trial mixes and place mock-ups to ensure that all parties are satisfied with the materials selected. 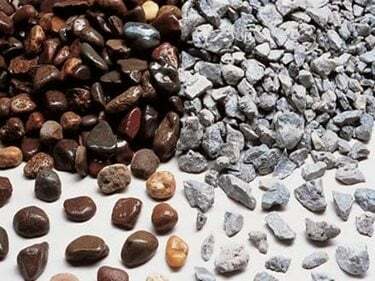 Both gravel and crushed stone are generally acceptable for making quality concrete (Photo 9), although gravel is usually preferred for exposed aggregate. 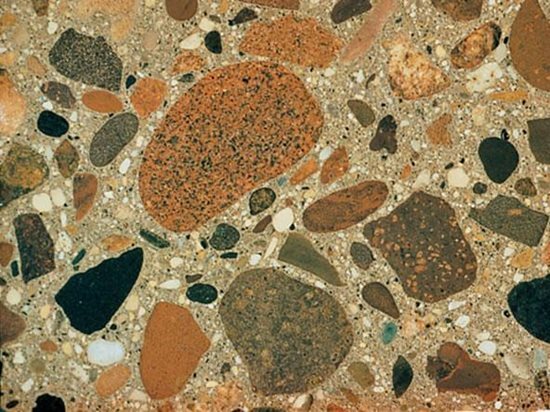 The use of recycled concrete, crushed to proper-size concrete aggregate, has also demonstrated successful performance. Recycled concrete will have a higher absorption and lower specific gravity than conventional aggregates. To produce good quality, durable concrete containing a portion of recycled concrete aggregate often requires trial concrete mixes and close monitoring of the properties of the old recycled concrete, with mix adjustments made, as needed. The absorption and surface moisture of aggregates are simple yet critically important aspects of producing concrete that consistently achieves the specified or targeted strength. 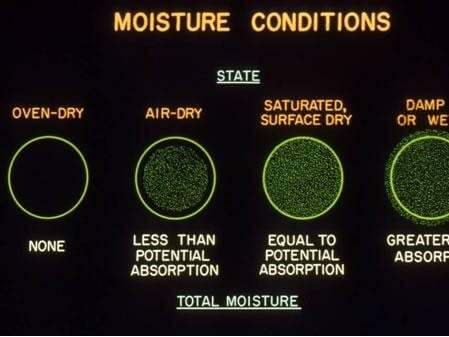 The fundamental relationship between water-to-cement ratio and strength starts with correcting for the moisture contribution or absorption by the aggregates. Aggregates are somewhat like small, hard sponges. Mix design calculations are conducted assuming aggregates are in a saturated surface dry (SSD) condition, meaning their absorption is satisfied and no water is taken from or added to the mix. If their absorption is not satisfied, these "sponges" steal water from the designated quantity of mix water, reducing the slump of the concrete. If the "sponges" are excessively wet (beyond that amount to satisfy the absorption), the extra water must be subtracted from the quantity of batched mix water. Otherwise, the target w/c ratio is exceeded and strengths will decrease (Figure 2). DO use aggregate that's in compliance with ASTM C 33, "Standard Specifications for Concrete Aggregates." Aggregates must be sound, clean, hard, durable, and free of excessive fines or contaminates that can affect cement hydration or disrupt the paste-aggregate bond. DON'T exceed limits for deleterious material content in fine and coarse aggregates. These limits are presented in ASTM C 33 Tables 1 and 3, respectively. Some specifications may require more stringent limitations. DO monitor moisture contents of coarse and fine aggregates on a regular basis to promote batch-to-batch consistency and uniformity. Moisture probes in aggregate bins should be calibrated according to manufacturers' recommendations. Moisture probes should also be checked periodically with standard burn-off moisture determinations (ASTM C 566). DO make sure stockpiles are properly managed. They should be built in horizontal or gently sloping layers to reduce segregation and be adequately spaced to allow working the piles properly. In areas where yard space is limited and stockpiles are difficult to keep separate, barriers should be used to avoid intermingling and cross-contamination of different-sized materials. Design and Control of Concrete Mixtures, Portland Cement Association (see Chapter 5, Aggregates for Concrete). American Concrete Institute (ACI) Committee Report 221R-96, Guide for Use of Normal Weight and Heavyweight Aggregates in Concrete, Section 4.5.